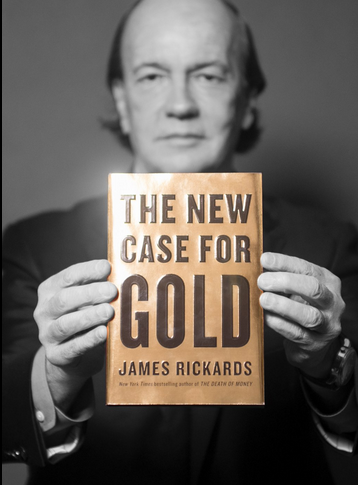 A synopsis of an interview with Jim Rickards, New York Times bestselling author of The Death of Money, Currency Wars, and the newly released The New Case for Gold by Alix Steel and Scarlet Fu at Bloomberg. The gold debate has been going on for decades and centuries, but there are 21st century reasons for owning gold. Vladamir Putin has a 6,000 member cyber brigade. These are not criminal gangs, they are Russian military and intelligence working day and night to destroy, disrupt and erase digital assets. When Jim runs into billionaires they say they have stocks and bonds. No they don’t. They have electrons. It’s digital wealth and it can be wiped out by Putin, Syria, Iran, North Korea and other countries. A good example is a few days ago Bangladesh had $100 million disappear. One of the poorest countries in the world. They had it on deposit at the Federal Reserve in New York. The safest bank in the world. So if you don’t have some assets that are tangible it can all be wiped out. Jim recommends 10% in physical gold, real estate, fine art and silver for example. There are a bunch of old reasons for owning gold but that is one of the new reasons. Why does the U.S. have 8,000 tonnes of gold? They should have more, but why do they have that large amount? Jim believes it would be best to have a gold standard in either the strict traditional sense or else as a benchmark. For example, when people say gold is up or down it just means that a higher dollar price for gold is a lower value for the dollar. A lower dollar price for gold means the dollar is stronger. Gold’s value is usually inverse to the dollar. It’s a chameleon. Sometimes it’s a commodity, sometimes it’s an investment and sometimes it’s money. Right now it’s acting as money. Think of it as a horse race. You’ve got the euro, the yen, the dollar and gold as horses going around the track. The dollar and gold are both showing some strength because of a little bit of a flight to quality. Right now the Fed’s dovishness will lead to a weaker dollar. The U.S. dollar is on a ten-year high so Jim expects a weaker dollar and a stronger euro, stronger yen and stronger gold as the dollar weakens. Gold is very liquid — you can sell it in a heartbeat. In comparison to gold’s liquidity look at the bond market. In October 2015 there was a flash crash in yield, so there was no liquidity in the U.S. government bond market. Primary dealers are stuck with inventory that they often can’t sell. Jim’s never seen gold not have a bid. It’s volatile but it’s very liquid. China is the largest gold producer. They have 450 tonnes of indigenous output so they don’t have to import all of the gold they want. They are also importing enormous amounts of gold. China lies about their gold holdings. You can look at Hong Kong exports and mining output and it’s far greater than what the Chinese government says they have. So there’s a lot going on that’s not revealed. China still wants to buy 3,000 tonnes to reach parity with the U.S. holdings. That’s like all the swimming pools filled with gold. It’s 10% of all the official gold in the world. That’s why they don’t talk about it. If you were out to buy 3,000 tonnes you wouldn’t want anyone to know it because the price would go up. The U.S. has 8,000 tonnes and China has between 4,000 – 5,000 tonnes. They need another 3,000 tonnes to have parity, so that when the system collapses they’ll have a good seat at the table. Think of it as a poker game. You want a good pile of chips when you sit down at the table. Paper gold is not gold — it’s an Exchange Traded Fund (ETF). When you buy an ETF it’s like buying stock on the New York Stock Exchange. It can be digitally hacked and they can shut down the stock exchange. People say that can never happen, but the New York Stock Exchange was closed for five months from July to December in 1914. It closed in Hurricane Sandy. It closed after 9/11. It closes every weekend. With paper gold you don’t own gold. It’s a share. You have to buy and sell it. But you don’t own the gold and you’re not going to get the gold. You have COMEX gold futures, and if all the longs stood for delivery the COMEX would terminate the contract. They would cash settle it and you wouldn’t get the gold. They only have 1% of the gold relative to the open interest. All the paper gold contracts give you price exposure when you don’t need it and they’re going to terminate it when you want it the most. You’re not going to get the gold. Gold is going to go to $10,000 U.S. per ounce. That is the implied non-deflationary price. In other words, if you’re going to go back to a gold standard you need a gold reference what does the price of gold have to be to support world trade, world commerce and the money supply? That’s eighth grade math and not difficult to figure. The blunder would be to go to a gold standard at the wrong price. That would be highly deflationary, and that’s the mistake that Winston Churchill made in 1925. The implied non-deflationary price is low end $10,000 per ounce and high end, if you used Global M2 with 100% percent backing (which Jim does not recommend), then the price of gold would be $50,000. That’s where gold would end up when confidence in paper money is lost. And that will be in the next crisis. The New Case for Gold is available now at Amazon. In my final week and a half of academic degree work at Simon Fraser University in Vancouver, Canada. Very much looking forward to full time art + media. Please excuse the delay while the last finals for Communications Theory and Publishing are written. New branding, music, products, commentary and website coming soon.